The client, Marshalls Pest Control, is a local pest exterminator who has been in business for over 50 years. The client had previously had a website that they created on Wix, but weren’t happy with how buried their website was on Google when local searchers were looking for pest control. 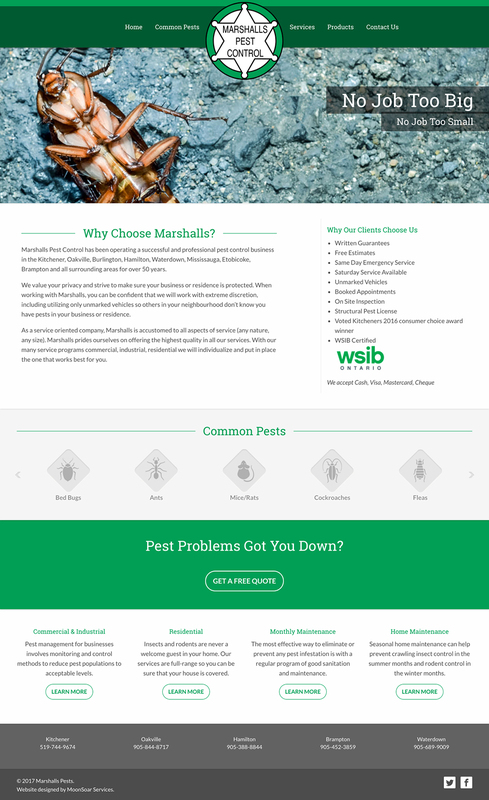 We worked with the client to create a search-engine friendly website that was easy for them to update, that illustrated the types of work they did, and that showcased why someone should choose them to solve their pest problems instead of their competitors. We put a focus on local SEO tactics to ensure that Google and other search engines will rank Marshalls Pest Control highly. The website was fully custom designed and developed on the WordPress platform. The client has seen their search rankings increase.